Sidni Larkhearst lived a simple life, delivering messages for her village, until her home is attacked by vampires one night. To her horror, Sidni learns that Dracula, the most feared vampire of all time is hunting her. But why? 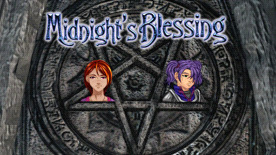 Find out in Midnight's Blessing!